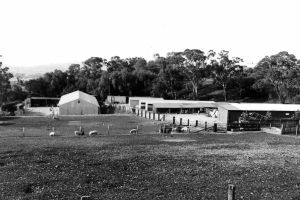 The first recorded introduction of pigs into South Australia was via sealers on Kangaroo Island and the strain still persists as a feral animal. Later early settlers migrating from Europe brought pigs with them to the mainland. Over the years many breeds of pigs have been introduced and many of these with high genetic worth. 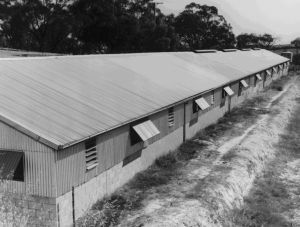 Since early settlement, developments in housing, nutrition, marketing and processing have progressed, to achieve the highest export standards for the South Australian pig industry. The Feeding of Pigs: In the early days pigs were fed from food scraps. They later became a sideline to the dairy industry, in order to utilize by products from butter and cheese manufacture, they were fed the left over skim milk and whey. Their diet was next extended to include home grain, which allowed the industry to further expand. Figures 1 to 3 show various methods used to feed pigs. Feeding standards improved with the introduction of on-farm mixing equipment (see fig 4) or alternatively the purchase of commercial ready mixed feed; usually in the form of pellets. The Department of Agriculture provided a computer generated least cost feed formulation service, that quantified the availability and cost of the various ingredients and evaluated their suitability for different classes of pigs. 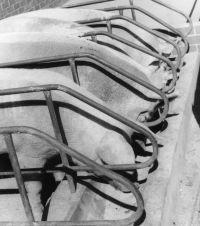 Figure 1, Photo 104972, Dry sow feeding in stalls. 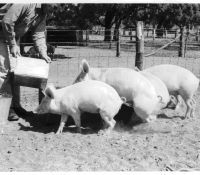 Figure 2, Photo 104977, Feeding pigs outdoors. 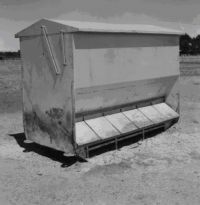 Figure 3, Photo 104976, Self feeding unit for pigs. 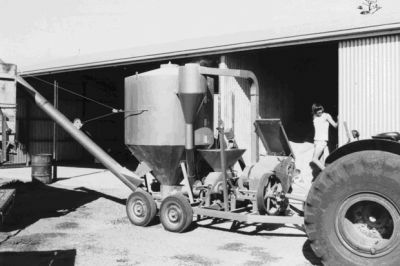 Figure 4, Photo 103733, On farm milling and mixing plant incorporating hammer and roller mill. The Housing of Pigs: Before the pig industry developed, pigs were mostly kept as a sideline enterprise on mixed farms, they were kept in outdoor runs and rough shelters (see figures 5and 6). Subsequent development brought better sheds and concrete yards for easy cleaning (see figures 7 and 8). Through further progress, many pig producers changed over to intensive housing. The intensive sheds had various forms of effluent disposal, such as slotted drainage floor pits. These were connected to either outside effluent ponds (see fig 10) or were disposed by tanker trailers which carted the effluent off site where it was sprayed on the land for fertilizer (PDF 5.7 MB) (see figure 9).A further development was group housing in sheds using straw bedding. Figure 5, Photo 104868. 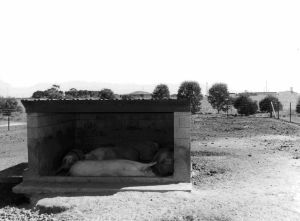 Figure 6, Photo 104871, Rough shelters used to house pigs. Figure 7, Photo 104881, Pigs kept in these units have a choice between an inside shelter and an outside run. Figure 8, Photo 104890, Example of intensive pig shed. Figure 9, Photo 104920, Spreading pig effluent as valuable fertilizer. 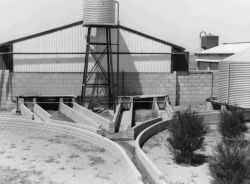 Figure 10, Photo 104917, Effluent drains outside intensive pig shed, used for transferring wastes to outside ponds. The Sale of Pigs: Pigs were mainly sold live at action in public sale yards. Some producers sold pigs on consignment direct to processors. Payment was made on dressed weight and carcass quality. Some agents would visit properties to purchase pigs. The Department of Agriculture introduced an 'On Farm Testing' scheme whereby operators visited the property to weigh and measure back fat thickness using scales and sonar measurements, thus providing a performance score, which greatly assisted the producer to select breeding stock. 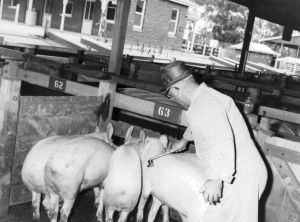 Later the department introduced the 'Abattoir Feed-Back' scheme, where an operator would examine a line of pigs at slaughter and report on disease levels. This enabled the producer to compare previous reports and thereby assess the response to treatments. The Health of Pigs: Pig health control, in terms of infectious diseases, was governed by legislation known as the Swine Compensation Act. Under the Act the disease control program was funded by a levy on all pigs sold. 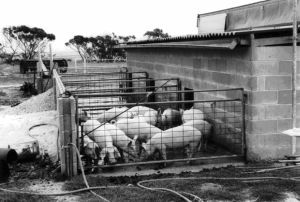 At the request of pig producers, an amendment to the Act enabled funds to be used to create the Northfield Pig Research Unit. In addition a boar testing station was established. The Pig Branding Act was introduced which demanded that producers brand their pigs with their registered brand before sale. This enabled diseases to be traced back to the property of origin. (see figure 11). Figure 11, Photo 104966 Joe Stanley, Department of Agriculture, Stock Inspector, demonstrating the branding of pigs. Numerous carcass competitions provided valuable feedback on carcass quality. Measurements recorded were for body length, back fat thickness, and eye muscle area (see figure 12). Points were awarded for visual judgment of streak and general carcass quality. Well attended displays allowed producers to see all of the entries, thereby gaining valuable information on desirable carcass quality. 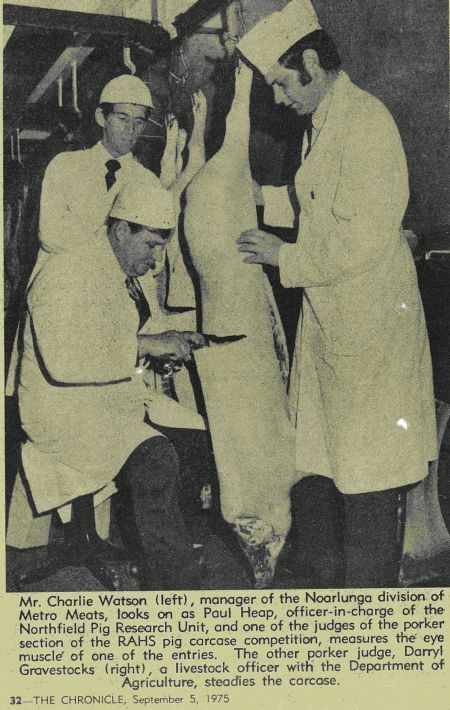 The Department of Agriculture and the pig industry provided many of the judges for these competitions. There have been many improvements in the processing of pig meats, through manufacturing a diverse variety of bacons, hams and small goods. Many of these improvements have been due to expertise of migrants from Europe, whose families have over centuries, developed a tradition in preserving and smoking pig meat products such as sausages and hams. Figure 12, Pig carcass quality competition promoted by 'The Chronicle' paper.